Why would you spend weeks and months to knock a minute off of your run time or to get a little faster on the bike but waste minutes in transition? It doesn’t have to be that way. I’ve been lucky. Lucky to have been coached, buddies and the honor to spend time with some pro triathletes and some REALLY fast amateurs. They’ve taken the time to toss some tips and tricks my way. With some practice, I’ve managed to get some decent transition times. You have the opportunity for me to pass those along to you and it won’t cost you a dime. Ok. Well, you’ll have to pay for parking, but my time is free. Want more info? Attend only the clinic or stick around for the course preview. The XTERRA Transition Clinic and Course Preview are for both the novice and experienced triathlete. Transition is the fourth element of triathlons, yet carries a lot of importance in the race. This clinic will cover the basics and also provide tips/tricks to make your transitions quick and easy. 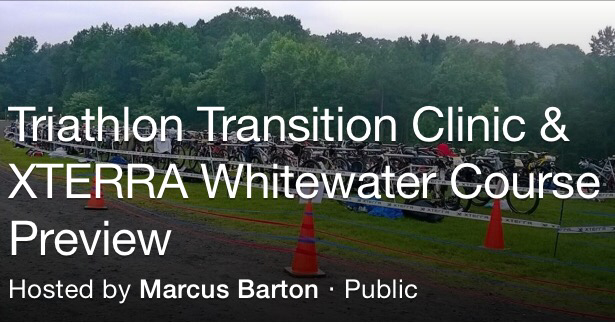 Join the USNWC and XTERRA Ambassador, Marcus Barton, to learn some simple steps to make your transition faster and more effective. The clinic begins at the Adventure Pavilion with a quick discussion about the upcoming XTERRA Whitewater Triathlon. Immediately followed by a pre-ride of the XTERRA Whitewater bike course, pausing along the way to discuss and practice some of the more advanced obstacles/sections. For those wanting the full experience, there will also be a pre-run of the XTERRA Whitewater run course. Also discussed will be the transition area and two-part swim. Equipment you’ll need: mountain bike (no cross bikes or drop bars allowed since they won’t be for the race), helmet, water bottle(s) or hydration pack. Bikes can be rented from the USNWC. If you’re running, you’ll need running shoes and hydration. Helmets are required. You can rent bikes and helmets at the USNWC Trail Center if you don’t have your own. Meet at the outdoor pavilion near the trailhead (take left into first parking lot and go to the top of the hill. Pavilion on the right.